With no currency system, no option to "buy power", and some great gameplay, Path of Exile is hoping to shake the action RPG scene up a bit. 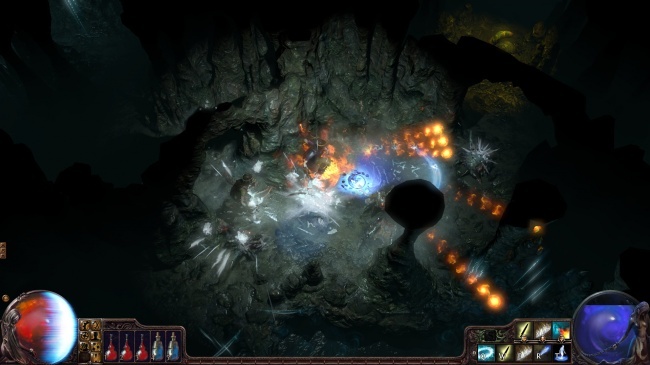 A minute into my demo of Path of Exile, a PAX attendee loudly told his friends that the game was clearly a Diablo rip-off; as they continued on their way, I looked at Chris Wilson, CEO of Grinding Gear Games (the game's developer). My arched eyebrow left an unspoken question hanging heavily in the air. Wilson, to his credit, chuckled a little before acknowledging, "yeah, I've heard that a lot throughout the show." At first glance, it's an easy presumption to come to. 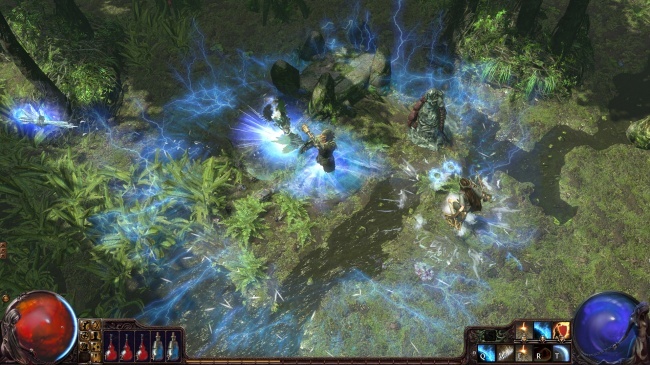 Path of Exile is an upcoming online, dark fantasy action RPG. It features the same sort of fixed isometric camera that Diablo became famous for, it's set in a depressed fantasy world, and it's pretty dang violent. 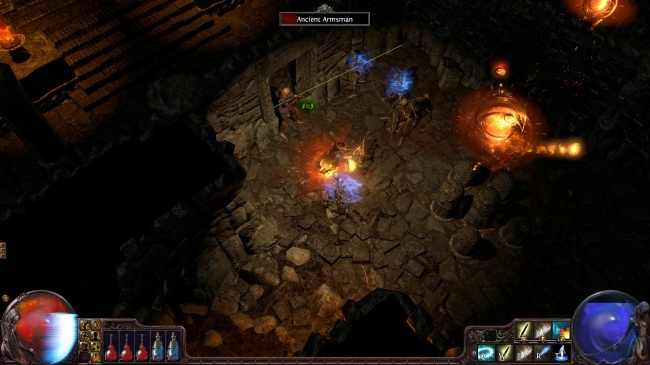 However, after spending some time with the game, it's safe to say that there's enough unique content here that will allow Path of Exile to stand on its own two feet. The initial setting is fairly simple: The player-character is exiled from his/her homeland to a dark continent that's swarming with all sorts of unspeakable monsters. As a result, every day is constant battle for survival, and the only way to survive is to live by the sword (or staff, or arrow, or magic, or whatever). Currently, there are five planned character classes for the game. My time with the demo was spent using a duelist, whose primary attributes are strength and agility. His special ability came in the form of being able to dual-wield swords, and he had a number of special attacks like a sweep that could hit multiple opponents at once and a poison move that could be used multiple times against more powerful enemies. Now, seeing as this is an action RPG, there's a lot of loot to collect as players cut their way through the game. The difference between this and so many other titles in the genre is that there's no gold. Instead, players have to trade for gear with each other via an in-game bartering system; according to Wilson, this will promote "cutthroat gameplay." As opposed to many other online game developers, New Zealand-based Grinding Gear has no desire to "sell power" to players. In other words: Players can't buy a leg up over other gamers. Wilson did confirm that micro-transactions will allow folks to purchase cosmetic additions, but, "if you see a player with an amazing sword, we want you to respect them because they earned it. We don't want people to think they bought it." This whole "cutthroat" approach is certainly a unique idea, and it's one that also simplifies gameplay. Because players can't buy potions to replenish their health, there are a set number of potions (which players can determine the type of) for them to use, and they replenish over time as enemies are slaughtered. The demo on the floor was a PvE build, though a video of PvP gameplay was on display over the station. According to Wilson, PvP is pretty functional, but it wasn't quite ready for a hands-on demo by the time of the show. That said, the video play looked solid, but it clearly is too early to comment on that play mode. As I marauded through the land, laying waste to my enemies, I was surprised by how much fun I was having. The action was frantic, the graphics looked great (which Grinding Gear is proud of, having developed the visual engine internally), and the enemies were pretty varied. Even the boss battle - against a crazy squid creature that masquerades as a beautiful woman for the first part of the fight - was a blast. 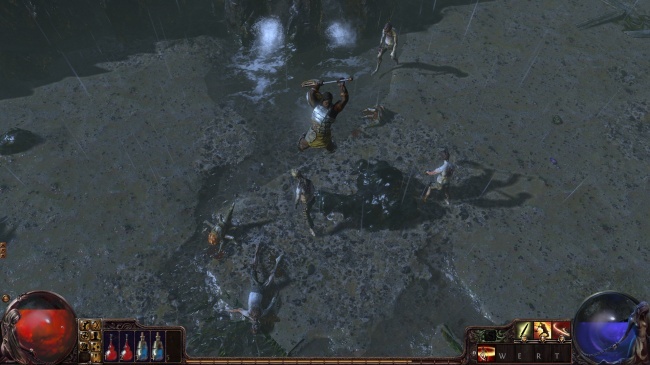 Path of Exile is due to start its open beta in January, with the game officially launching sometime later next year. If you're interested in more info, head on over to the game's official site.